Gondorian heavy cavalry charging, from Return of the King. 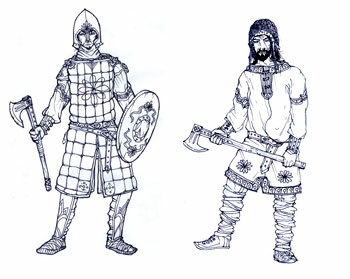 Gondorian auxiliaries from Lossarnach, by Jan Pospisil. 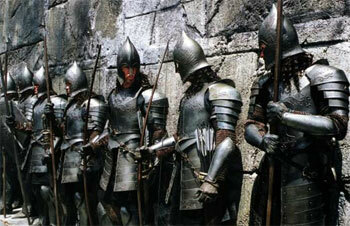 Royal army line infantry, from Return of the King. Lebennin guardsman and Belfalas squire, by Jan Pospisil. Kataphrakt from Lossarnach, by Jan Pospisil. Following the destruction brought by Kin-Strife, Gondor's ancient political structure evolved to cope with decreasing wealth and population. The realm's decline became apparent to the ruling classes, who could do little to reverse the ominous trend. The loss of Umbar in T.A. 1448 caused a noticeable shrinking of southern Gondor's economic base. Umbar had been one of the richest cities of the realm and the hub for the southbound trade, giving the kings a sizable customs and tax income in coin. At the same time, parts of the Vale of Anduin were ravaged by the war, and generated little or no income for the goverment. By then the will to invest in business and manufacturing was nearly gone, since most Gondorians preferred to place their money in safe and value-stable investments such as land and jewelry. The Crown subsequently faced a fiscal crisis, while the realm as a whole suffered from monetary shortage and a decline in trade. This development quickly accentuated the value of land and agriculture. Trade declined more severely. The power balance within southern Gondor's elite gradually shifted in the landowners' favour, at the expense of both the merchants and the royal goverment. The gradual process of feudalization had begun. An expensive rearmament during the latter half of the fifteenth century aggravated the recession. Gondor faced an implacable southern foe, and diverted its dwindling resources. Its rulers had to maintain extensive military establishments in Harondor, Belfalas, and Lebennin to defend the realm from Corsair raids. At the same time, the navy had to be rebuilt from scratch. There was no longer coin enough in the King's treasury to pay for these new forces. Instead, individuals were rewarded with land or privileges from their service. The realm also began to sell future revenues for cash. In outlying locales, many regular army Gwethyr (S. 'regiments') were substituted by Herthyr, companies sponsored by a lord. It was each lord's responsibility to raise and maintain a troop in territorial army corps, whose task was to defend his domain. These forces were rarely expected to fight outside the provincial borders; such military ventures were still the responsibility of the Crown. A new kind of soldier came into existence, receiving a small farm from his lord for service in a provincial regiment. He conducted military exercises during the months allowed by agriculture. In case of war, he was mobilized and his regiment attached to the provincial corps. The Great Plague caused Gondor's economic base to shrink even further. About two-fifths of the population died, a significant proportion of which were well-educated townsmen, again decreasing the realms' tax incomes. Unfortunately, the requirements of military defense remained high. King Tarondor was forced to use every available measure to raise capital and manpower. The settlement of soldiers on land in lieu of a salary, the hiring of private companies, the selling of future revenues and the use of conscription became very common, even in the Vale of Anduin. The traditional Dúnadan army had been badly depleted, of both officers and men, in the Kin-Strife. Both in the aftermath and during the civil war, Eldacar called on as many barbarian irregular forces as he could muster. Initially, these were assorted northman groups, along with allies from Rhovanion, but later they included the main strength of the Éothraim settled under treaty, who contributed a reputed 20,000 men to his army in 1447. Northmen were recruited either individually, trained, equipped and disciplined to fill gaps in the ranks of regular units, or en bloc as federate allies under their own leaders (under treaty obligations, or for pay and loot, or both) in temporary campaign armies. Eldacar had let a significant number of his northmen to settle in the southern provinces. But Aldamir, anxious to placate the feelings of his countrymen, dismissed 2/3 of his northmen federates, who returned to Rhovanion. Aldamir started the reconstruction of the Gondorian war machine. He was the first to introduce a territorial army system, where part-time soldiers, paid both in land and coin, manned the defensive fortifications along Gondor's northern and southern borders. Rich landowners were urged to finance the new companies in return of tax exemptions and new privileges. Due to battle and financial constraints, the quality and strategical mobility of the army continued to decline substantially during the 16th century. The 1540-1551 war against Haradwaith and Umbar, mainly fought in Harondor, badly depleted its ranks. The regular army under Aldamir consisted of two components: the mobile field armies - Dagarim Aran - grouped into four regional bodies, and the territorial garrison armies based mainly along the frontiers. At the end of the 16th century, there were distinctions of pay, privilege and status between these grades. However, territorial units often fought well where needed, formed part of campaign armies based on their regions, and were occasionally raised to the field armies. 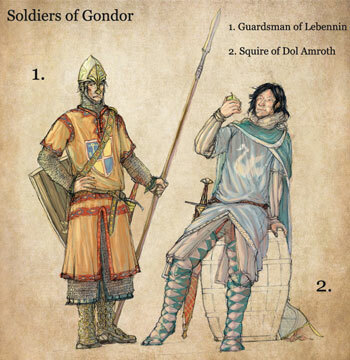 Approximately two-thirds of the Gondorian forces consisted of territorials. In addition, during the periods of relative peace which prevailed on the frontiers at times, the territorial corps were responsible for the day-to-day work of policing the borders: collecting information on enemy intentions, controlling routine movements and generally maintaining the peace. This customs and policing rôle was essential in providing a level of security for provincial economics, maintaining internal security (banditry was a serious and endemic problem in some areas) and controlling trade. The Aldamiri organisation of the army under four independent top commanders plus one responsible for the Federates had been a rational response to challenges on different frontiers, as well as a mainstay of political stability. Yet it meant that even at full strength and efficiency, which was not always the case, only perhaps a quarter of the realm's full fighting resources were immediately available against an enemy threat at any time. Low-level attacks such as Haruze raiding could usually be dealt with locally, but serious invasions could not. The territorial limitanei could hold their positions in defensive strong-points and hamper an invasion, but not defeat it in battle. To do this required the main field army. Dagarim Aran represented a strong mobile reserve, but even so it was hardly practical to deploy more than two field armies - one regional, one royal - in any campaign without creating dangerous weaknesses elsewhere. The Corsairs, as well as Asdriags and Dunlendings, were aware of large-scale Gondorian troop transfers and knew how to take maximum advantage of them. The Great Plague in 1635-38 sapped Gondor's military strength even further. Many renowned companies were decimated, and it soon was obvious that the organization of Gondor's army required another complete overhaul. A comparison of units known before 1621 and those surviving in the 1650s suggests that the southern field army had lost over half of their strength. Attempts to repair this damage had been made, partly through new recruitment but mainly through the paper exercise of upgrading territorial troops to the status of dagarim. Over 4500 men were designated this way. The damage to the Territorial Corps had also been on a massive scale: at least 20,000 men, roughly one-third of their strength, had been lost over a period of ten years. As royal revenues dwindled, soldiers were paid only once in three years. In some cases pay was first postponed and then suspended. Many frontier regiments either deserted or crumbled into oblivion. Tarondor solved the problem by dividing the Territorial Corps into four groups which served for a full year on a rota basis once every three to six years, so that a small core of regulars was available at all times. From the 1640s on, the bulk of the army consisted of provincial infantry forces, raised and maintained locally by lords and governors for defensive tasks. They enjoyed little strategic mobility or sophisticated logistical support. During this period, each lord and governor - except in Anórien, Ithilien and Lebennin - was responsible for recruiting and maintaining a territorial corps of a defined size and composition, which was to be stationed in the cities and fortresses of his domain. This force would consist of full-time soldiers (remnants of the old Territorial Corps) on rotation and part-time reservists. Living as freeholding peasants, the latter served during a few months each year. Gondor's mobile force, the King's Corps or Dagarim Aran was re-established in 1643. Former, badly depleted field armies were disbanded and combined into a single host. Dagarim Aran was now even smaller than before, rarely exceeding a strength of 20,000, of which perhaps one tenth was cavalry. 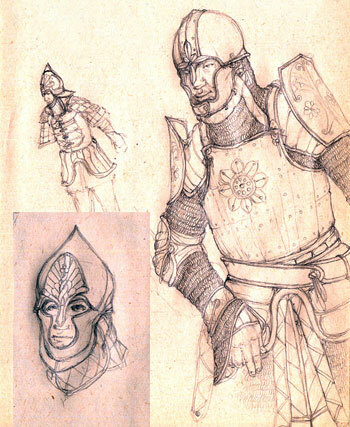 But under the command of king Tarondor's trusted uncle, Vinyaran (Tarondor nominated him as a berthir i dagarim, magister of the Armies), and later Minadir his grandson, Dagarim Aran became more versatile and efficient force than before, durable and highly mobile, and possessing excellent logistic capabilities. Trained to fight either at full strength or as an array of isolated detachments, it proved to be adequately flexible tool, as was aptly displayed in the capture of Umbar in 1810. Gondorian soldiers were generally well paid. Territorial troops received six to nine erin (gold crowns weighing 1/36 of a pound) and royal troops ten erin per annum. In addition territorial soldiers also had grants of land, which king Aldamir (1330-1540) decreed must be worth at least to two pounds of gold (64 gold crowns) for infantrymen and four pounds (128 gold crowns) for cavalrymen. One additional crown was paid to King's regulars for every four years of service, up to 20 years. Vinyarion Hyarmendacil increased soldier's wage by giving additional donatives every five years. These quinquennial donatives were paid in precious metal and were worth of a pound of silver per soldier. However, the regular pay of the army had deteriorated in value during the 16th and 17th centuries. This problem was dealth with by providing food, uniforms and weapons as payments in kind (earlier, soldiers were responsible for paying their supplies out of their pay), but this left soldiers at the mercy of the official issue for the quality of items, and removed any possibility of supplementing pay by being careful or frugal with the official issue. ARMY GROUP ITHILIEN (Commander: herdir vagorim Callo Telagar, second in command: condir Námotur Usulúni). 5,000 line infantry, 600 medium cavalry, 100 haruze light cavalry, 500 variag archers, 1,000 auxiliaries and servants, 1 siege train, 240 artillerists. Stationed at Tir Ethraid, Athrad Poros, Methir, Barad Laer and Hyarpendë. ARMY GROUP ROMEN (Commander: herdir roechbin Belatar, second in command: rochir Ardaric). 4,000 line infantry, 300 medium cavalry, 200 asdriag raiders, 1,200 northman archers, 1,000 éothraim federates. Stationed at Romenost, Othlebed, Burh Sauthis, Thorontir. PALACE GUARD (Commander: autherdir Sigisfrith): 80 knights of the Fountain Court, 400 tirrim aran, 320 arhivilyr, 40 naphta throwers. Stationed at Minas Anor, they are King's personal following. ANDRAST GARRISON (Commander: autherdir Macar): 300 anfalas archers, 150 line infantry, 600 royal engineers, 20 artillerists. Stationed at Tharagrondost, overseeing construction of fortifications along Andrast shore. THARBAD GARRISON (Commander: canotar Imlach): 60 arhilivyr, 500 mercanary auxiliaries. ARMY GROUP POROS (Commander: herdir vagorim Húrin Orchaldor, second in command: condir Hardang Seldorien). 8,000 line infantry, 800 medium cavalry, 200 haruze light cavalry, 500 variag archers, 1,000 auxiliaries and servants, 1 siege train, 360 artillerists, 2,000 peasant levy as workforce. Stationed at Tir Ethraid, Athrad Poros, Methir, Barad Laer and Amon Eithel. ARMY GROUP ROMEN (Commander: herdir roechbin Valerian, second in command: rochir Radagast). 5,000 line infantry, 400 medium cavalry, 200 asdriag raiders, 1,200 northman archers, 1,000 éothraim federates. Stationed at Romenost, Othlebed, Burh Sauthis, Thorontir. PALACE GUARD (Commander: autherdir Rúthion): 96 knights of the Fountain Court, 400 tirrim aran, 320 arhivilyr, 200 royal archers, 80 naphta throwers and royal engineers. Stationed at Minas Anor, they are King's personal following. PELARGIR GARRISON (Commander: autherdir Ulraed Curimardin): 100 élite line infantry, 400 city guards, 400 toll-wardens. Stationed at Pelargir and Hyarpendë. ANDRAST GARRISON (Commander: autherdir Hunthor Falmathil): 600 anfalas archers, 200 éothraim cavalry, 300 line infantry, 400 royal engineers, 60 artillerists, 20 naphta throwers. Stationed at Tharagrondost. The basic unit for both cavalry and infantry was the tulkarim, or squad, of sixteen men, including an officer called cainenhîr ('leader of ten'), and five methyr iaur ('veterans'). Six, nine or sixteen tulkarim would form a turma, or company, derived from high eldarin word for a shield or banner. Paper strength of a full infantry turma would be 256 men excluding standard-bearers, musicians and officers. Mounted troops followed a somewhat dissimilar: four cavalry tulkarim constituted a winglet, and two winglets a squadron, led by a Rochben Iaur, a 'senior knight'. By the second half of the 17th century there were only ten rather than sixteen men in cavalry tulkarimi. Actual units taking field were even more understrength. At a higher lever army organization was in gwethyr and herthyr. Footsoldiers were divided in regiments (gweth), and consisted of a variable number of turmar, on average between two and five. Herthyr was a somewhat archaic sindarin term which originally meant an armed retinue or a band of warriors following a noble. During the reign of Vinyarion Hyarmendacil herth was used rather ambiguously; it could mean an élite cavalry troop or a territorial army regiment raised and financed by a local hîr (lord). The Guards of the Fountain Court are selected from the very best of the Citadel Guard, swearing to give their lives in the service of the King and to be fearless in combat. They wear winged helmets made of mithril, intricately crafted heavy armour and carry the best weaponry that the armouries of the White City have to offer. Fountain Court Guard is known for its ferocious and blind loyalty to the King. They attend almost all royal ceremonies: four Knights of the Fountain guard the White Tree all times. Founded as an order of elite guards answerable only to the king of the southern realm. Only the best warriors that Gondor has to offer are picked to join the Guard, to be clad in their ancient armour and to carry blades of Westernesse and númenorean steel composite bows, heavy with both age and honour. The guardsmen themselves are the very image of the first Men of Núménor to settle the shores of Middle-earth, tall and stern, proud and steady in battle. They protect the lords of Minas Anor and the sacred places of the Mound of Mindolluin with a resolute devotion. In the absence of a king, the guards take their orders from the Steward of Minas Anor, sworn to obey his every command until death claims them. Tirrim Aran is permanently stationed at Minas Anor. Third elite guard company, of somewhat less renown, is the Tower Guard, Tirrim Arandur, dressed in dark hues of purple. They wear black breastplates and banded or lamellar armour over mail hauberks. These ministerial guards are armed with longswords and tall polearms. Their primary function is to provide security to the Steward and to act as his agents in the Realm. Armoured regiments of foot, mostly dúnedain from Anórien, Ithilien and lower Anduin. Reinforced chain hauberks and breastplates with additional steel vambraces and greaves. Line infantry are armed with shortswords (eket), long spears and tall shields. They are able to withstand almost any enemy charge with equal valor and stubborness. Four regiments of mounted soldiers are at King's disposal, ready to follow him to war and act as his bodyguard. They are distinguished by purple cloaks and pointed steel helms. Some of their warhorses have full barding, but most have not. 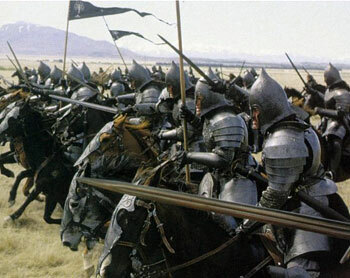 Gondorian mounted infantry is equipped with longswords (anket), bows, spears and kite-shaped shields. Royal Army archer regiments are recruited among logath easterlings and variags of Khand. They use their feared chyan recurved bows to shower their enemies with arrows. These mercanary troops are much disliked by gondorian commoners, but they have proved to be an invaluable asset to gondorian kings in the battlefield. They are issued with gondorian mail and various hand weapons for self-protection. Mercanary variag troops are equally useful in skirmish or scouting duty. Territorial line regiments of foot are raised from Lebennin, Harondor and Calenardhon to man fortifications, stop raiding parties and reinforce royal armies in times of war. They make use of mail hauberks, steel helmets, round or almond-shaped shields, swords and long spears. Territorial troop dresses vary from province to another. Pictured here is a harondorian swordsman. Territorial spearmen are not regular troops, but trained part-time soldiers raised among peasants. They train two-three months a year, otherwise they tend their lands. Most have only leather jacks worn over quilted gambesons, but richer landholders might have bought or inherited old-fashioned mail. They are armed with spears, short swords, hunting knives and target shields..
Territorial mounted troops are usually recruited among other peoples, especially eothraim and haradrim. They have quilted horse barding, quilted armour worn over either rigid leather lamellar or mail shirts and steel helmets. Horsemen are armed with long spears, short swords, axes and - sometimes - haradan scimitars. Irregular forces like Lamedon Clansmen light regiments of foot (pictured) or Haruze javelinmen are raised in time of war. They are useful in foraging or harrassing enemy supply lines. Best archers in the realm are the Anfalas Archer Regiments, composed of Langstrand yeomen. These men are armed with yew longbows, hand axes and long daggers hanging from their belts. For their protection poor men of Langstrand wear quilted jacks or reinforced leather armour, if anything. Gondorian peasants are obligated by law to practice archery certain times a month. They have only quilted or padded cloth armour and many use farm tools as weapons (mostly hand axes and hunting bows), since bow-making has alarmingly deteriorated after the Plague. Some have old military weapons as family heirlooms. Royal artillerists and war technicians operate ballistae and catapults. They have loose trousers beneath the mail hauberk, large leather-covered shields, heavy crossbows and shortswords. These specialist soldiers use Naurnen, the dreaded númenorean fire, as rudimentary hand grenades. Effect as +0 fireball. Best of the éothraim federates form the heavy cavalry wings of the royal armies. Most have excellent quality dwarven-steel mail hauberks with integral coifs and aventails, conical helmets, heavy warhorses with quilted or lamellar barding, lances, kite-shaped shields and heavy, slashing swords. Asdriag light horsemen are recruited as mercanaries to serve in Dor Rhûnen, and sometimes in Harondor. They are extremely fast riders and adept skirmishers, armed with three to five javelins, short recurved bows and long curved knives. Pelargir Wardens and other urban militias are funded by local guilds but usually armed from state factories, at least in the big cities along Anduin river. The same men who defend their homes against corsair depredations are known to occasionally revolt against their lords, or take law in their own hands. They are armed with short swords, kite-shaped shields and long polearms. Notes: DA = Dagarim Aran, King's Corps. TC = Territorial Corps. FE = Federates. Some of them are independent tribal forces bribed, coerced or negotiated to serve the winged crown. Others are mercenaries, attracted to gondorian silver.